On news of the deal, Canopy's Toronto-listed stock surged 30%, while on Wall Street, Constellation's fell 6%. 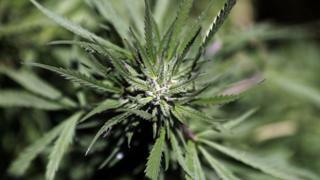 The two firms said the investment would allow Canopy to expand its business reach "in the nearly 30 countries pursuing a federally permissible medical cannabis programme". With Constellation's latest injection of cash, Canopy plans to expand its suite of products to include edible bars, inhalers and pre-rolled items. "This [deal] marks the end of the warm-up in our sector... it's fully go-time," said Canopy's chief executive Bruce Linton on an investment call. "Over the past year, we've come to better understand the cannabis market, the tremendous growth opportunity it presents, and Canopy's market-leading capabilities in this space," said Rob Sands, chief executive of Constellation Brands. Constellation's latest investment in Canopy takes its ownership in the firm to 38%. The deal is subject to regulatory approval and is expected to be closed no earlier than the end of October.